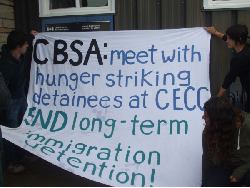 Lindsay, Guelph, Toronto – 191 migrants held in long-term indefinite detention are in critical condition as result of strike actions in a provincial jail in Lindsay, Ontario. At least six detainees have been hospitalized, and one Azuka Abagbodi is on dry hunger strike (no food or water) for the last three days. Migrants are striking against their long-term indefinite detention and prison conditions.“Canada can’t deport Azuka to his native Nigeria but refuses to release him to his family,” explains Mina Ramos who spoke to A. Abagbodi late Monday night. “It is absolutely heart wrenching listening to these migrants that have been jailed without charge or crime starving themselves to be heard while Canada Border Services and Minister Steven Blaney stay silent.”Strike action began on Tuesday, September 17th. A 24 hour hunger strike took place on Wednesday, September 18th, and all the detainees resumed the hunger strike on Monday September 23rd. Many of the detainees are still on hunger strike in what is the largest jailed migrant strike in recent history. Another thing we’d probably condemn if it happened in the States but just shrug at here. This is hideous. Sign the petition.